The Department of Education is responsible for managing emergency shelters across the Top End. Many of our facilities, including our schools, are designated emergency shelters. 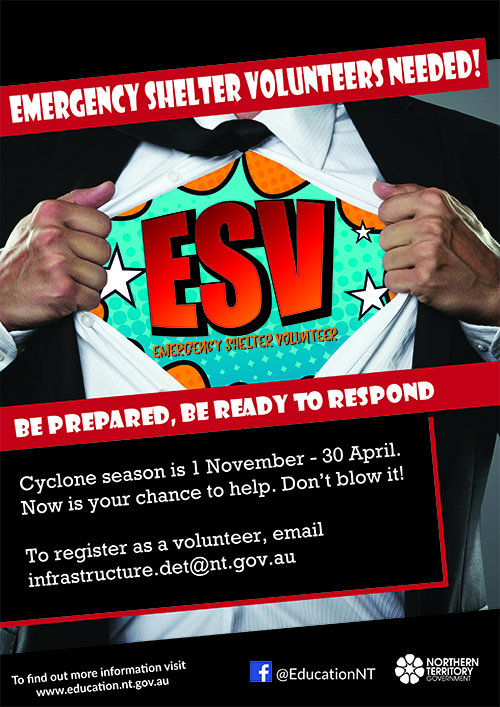 We are calling for volunteers from schools or government departments to work in emergency shelters in the event of cyclones, floods or other natural disasters. Emergency shelter volunteers are needed to cover a range of roles and assist with managing shelter personnel, coordinating communications, organising stores and equipment and providing direction and support. Volunteers will be required to be on standby during the cyclone season, be prepared to leave home for up to 48 hours and will need to have, or be willing to get, a working with children clearance (Ochre Card). In return, you will receive free training and get a wide range of opportunities to develop new skills, experience personal and professional growth, form new friendships and enjoy team spirit. Emergency shelters are critical to making the NT safer and more resilient in the event of a cyclone or flood. Volunteers will work alongside the NT police and St John Ambulance, who are responsible for looking after the community and providing first aid and medical response at emergency shelters. Volunteering in an emergency can be a rewarding experience. Get involved and offer your help when it is needed most. To register your interest or for more information email Infrastructure.DET@nt.gov.au , read Frequently Asked Questions or recruitment poster (34.7 mb). Emergency shelter volunteers come from all walks of life and everyone is welcome.